For over 20 years, Sporty’s has awarded a brand new airplane to one lucky customer just for placing an order. This time, we’re giving away a brand new Legend Cub. No other plane speaks to the heart and soul of General Aviation like the enduring Piper Cub. Originally produced from 1937 to 1947, the Cub’s simple and honest design has proven robust enough to be used in battle as a reconnaissance plane, yet still be a forgiving trainer. The Legend Cub combines the basic design of the original Cub with modern technology to create an aircraft that can be described as both modern and nostalgic. The Legend Cub, today’s most popular American manufactured light-sport aircraft, is a modern legend possessing the right blend of flyboy fun. We believe it to be unequivocally the most gratifying recreational aircraft in the skies today. Who is American Legend Aircraft? American Legend Aircraft Company is a manufacturer of general aviation aircraft with more than 34 years of industry experience. The company is committed to building the finest aircraft from the highest quality materials and best available craftsmanship. What is the Legend Cub? When defining the legendary American aircraft, one needs to look no further than the Legend Cub. 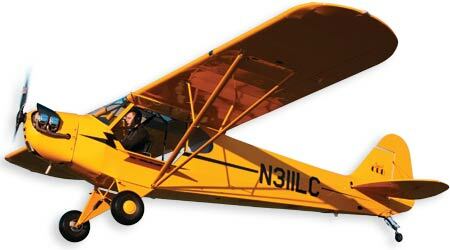 Using the classic lines of the enduring Piper Cub, American Legend Aircraft Company sought to build its modern offspring. The original simply had no equal. This is true today of the Legend Cub. Want to buy a Legend Cub? Call Sporty's!